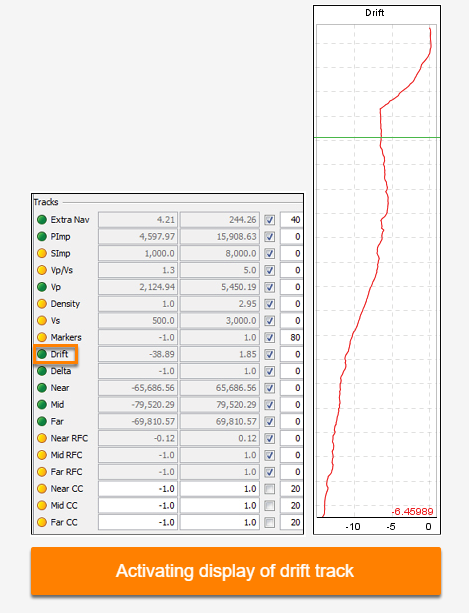 As part of the quality-control features in Synthetics, you can display a drift track which plots the drift curve. The curve shows the drift calculations denoting the difference in two-way travel time (TWT) between the checkshots and sonic log. Ideally, the drift would be zero, but due to many reasons including poor processing, dispersion, contaminated sonic caused by bad hole, etc, drift values often do not equal zero. Under the Tracks section, click the amber circle at Drift to display the drift track. The amber circle turns green which indicates the drift track is now displayed. By default, the drift curve will be displayed once you have activated the display of the drift track. However, if the curve is not displayed, go to the Curves section in the View tab and ensure that a green circle is shown at Drift. If it shows amber, click the circle to display the drift curve on the drift track. The drift values are shown at the bottom right corner of the drift track.